2016 Land Pride SSP2596 for sale in Canastota, NY. White's Farm Supply, Inc.
Land Pride's SSP25 Snow Pushers are available in 3 popular sizes to fit your skid steer or tractor loader. The 25 Series offers a 3/16" thick, 365" high moldboard, 5/16" side panels, and are available in 96", 10', and 12' widths. All models come equipped with AR400 skid shoes that are, adjustable, reversible, and replaceable. 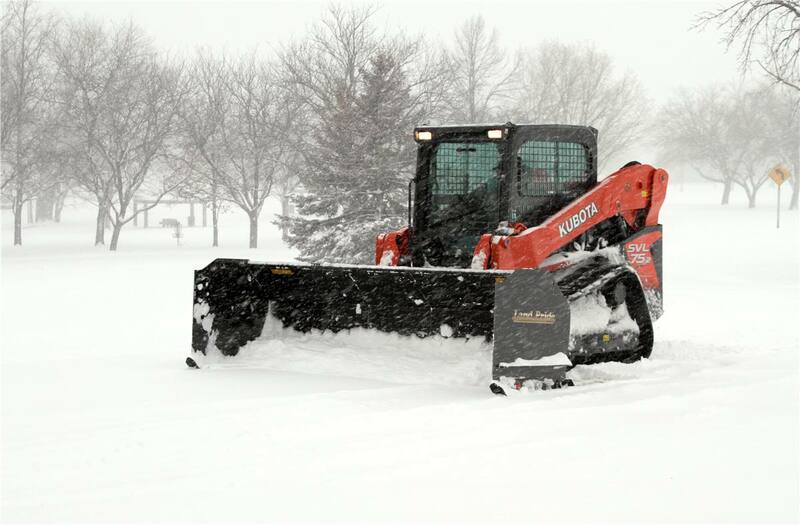 Land Pride Snow Pushers are designed to push snow straight ahead without leaving windrows or damaging the pavement below. The SSP mounts using the universal Quick-Attach plate and feature an 8” rubber wear edge. 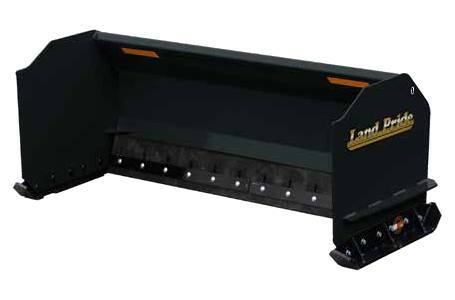 The rubber edge means Land Pride Snow Pushers eliminate damage to the pavement or lot striping on most surfaces while removing slush and snow. Universal quick attach hitch: Quick and easy to hook-up. Fits skid steers and tractor loaders with a universal quick attach hitch. Hitch frame is angled forward: Allows operator to rotate front of Snow Pusher higher for pushing snow up a snow pile. Can build higher snow piles with this design. 1/4" & 5/16" Heavy side panels: Built heavy to handle the tough jobs. Low profile exterior bracing on side panels and back: Reduces snow build-up on the moldboard and side panels. Reinforces side panels and back for a stronger unit. 1/4" Backing bar at blade mount: Makes for a strong moldboard. Skid shoes are constructed of AR400 steel: Gives a greater wear life. Z shaped steps: Allows snow to fall out of steps and helps prevent ice to build up. Two year warranty: Built to last. Reversible skid shoes: Skid shoes wear faster at the leading edge. Skid shoes that can be reversed will last longer than nonreversible skid shoes. Adjustable rubber snow blade: The blade can be adjusted down as it wears to extend its life. Reversible rubber and steel blades: The blades can be reversed to extend their life. Pull back with rubber blade: Used to pull snow away from garage doors. Weight with rubber Blade: 844 lbs.